Custom Burned Hatchboards — O'Day Mariner #1922 "Orion"
Will Gilmore (#2632 DRAGONFLY) posted something on the Mariner Class Association's forums that I just had to share. 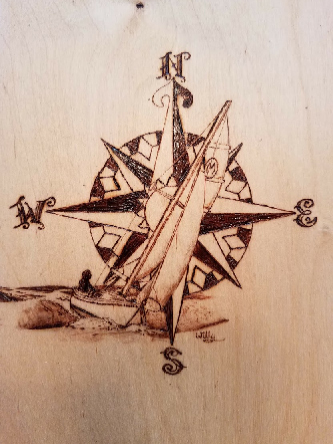 He made new hatchboards for his Mariner, but he went a giant step further by creating designs burned into the wood. My only recommendation is to go to the forums and check out what he has done and his process. He's hoping to make a little business out of it, and I can tell you one thing - I may just be his next customer. What do you think? Would you want a custom hatchboard with your own design?